Could having something as simple as a car fire extinguisher prevented a recent 2018 California wildfire? Here’s why: the headlines are filled with bad news of wildfires burning their way through entire communities, destroying thousands of homes, and upheaving the livelihoods of scores of residents and neighboring wildlife. Already one of the 6 largest wildfires in the state’s history, fire is still ravaging the landscape, displacing tens of thousands of families. And tragically, it has claimed the lives of both unsuspecting residents and selfless, heroic first responders. The largest fire, coincidentally known as the “Carr Fire,” reportedly began due to a car catching fire. Is that news to you? It was to me. I figured it was something like a lightning strike or downed power line, or something weather related. Statistically, however, I was wrong on almost all counts. According to the California Department of Forestry & Fire Protection, “approximately 95% of all wildfires in California are caused by human activity” including vehicle related incidences. As you can see, even if you’re far away from wildfire prone areas, stats like these make it pretty crystal clear why you should carry a car fire extinguisher as part of your Car Emergency Kit. To build on this, let me ask you another question — What is your preferred method of bugging out? On foot? Or by vehicle? I think most of us would prefer to drive rather than walk if at all possible, right? As stated above, on a national level the USFA reports that approximately 1 in 7 fires nationwide involve a vehicle… and this is when times are good. How much worse does it get when times are bad? Bugging out or not, just think for a moment how much time you actually spend in your car in a given week. If you live in a densely populated city, how many car accidents do you see during your daily commute? I commuted to downtown Kansas City, Missouri 5+ days a week for 4 years straight and rarely was there a day where I didn’t see a car accident or vehicle stalled on the shoulder of the highway during rush hour. Have you ever seen a vehicle overheated or on fire on the side of the road before? Have you ever been in a car accident or witnessed one yourself? How long did it take help to arrive? Do I know what to do if MY car or someone else’s car caught fire? Do I have the right tools to fight the fire before it spreads and causes great harm? The reality is, being properly equipped with both the knowledge and equipment (such as a car fire extinguisher), could save not only your life and the lives of your loved ones, but as we’ve seen with the recent wildfires, potentially the lives and livelihoods of countless others. Rather, the information below is a compilation of techniques and instructions from those who are experts in their field. If you want to dive deeper or check the sources used, they’re listed at the end of this article. That said, take this information for what it is — a simple guide to get you started on the right path. Only you can make the decision on how best to use it. We’re first going to discuss “7 Steps for Fighting a Car Fire”, including an easy way to remember how to use a car fire extinguisher in the heat of the moment. Then we’ll discuss “3 Rules for Knowing When NOT to Fight a Vehicle Fire” and leave it to the pros. And lastly, we’ll cover a handful of ways we can help prevent fires from starting or spreading in the first place. The first and most obvious step when dealing with a car fire is to get yourself and any others out and away from the vehicle. Even if the vehicle is in an enclosed structure such as a garage, get out immediately. Once within safe distance from the vehicle, notify the fire department at 911 or your local emergency number. If you have a car fire extinguisher in your possession ensure it is rated for “A,” “B” and “C” class fires. These are rated to specifically extinguish flammable or combustible liquids and gases such as oil and gasoline, and electrical fires as well as paper, wood, plastics, upholstery etc. I’m finding that most “car fire extinguishers” only cover B and C class fires, so I actually have one of these in each of my vehicles instead. Side note: While we’re on the topic of fire extinguishers, not only do I recommend keeping an ABC car fire extinguisher in your vehicles, but I also recommend keeping an ABC fire extinguisher in a strategic location on each floor of your home as well as in your kitchen and garage. Think of where fires are most likely to occur, where you may be at that time, and place your fire extinguishers in close proximity. And remember, a fire extinguisher is only going to do so much good if you can actually get to it, so keep it accessible. I bought these multi purpose home fire extinguishers on Amazon as I don’t really enjoy making trips to the store if I don’t have to and the convenience of online shopping is just too good for an introvert like me to pass up. 🙂 However, you can also get house or car fire extinguishers at your local Home Depot, Lowes, Wal-Mart, and even bulk deals at Sams or Costco. With the increasing popularity of alternative fuel vehicles on the road, other dangerous hazards present themselves in the presence of fire such as batteries, fuel cells, hydrogen, natural gas and even propane. If you encounter a car fire involving an alternative fuel vehicle it is best to stay away and call the fire department alerting them to the situation at hand. Chances are your car fire extinguisher will come equipped with a quick release pin on the handle or lever. To enable the fire extinguisher pull the pin. Your first instinct may be to aim at the flames rather than the base of the fire. This is incredibly ineffective as the agent will only go through the flames and out the other side. Rather, aim low at the base of the fire while keeping a safe distance as indicated on the car fire extinguisher. 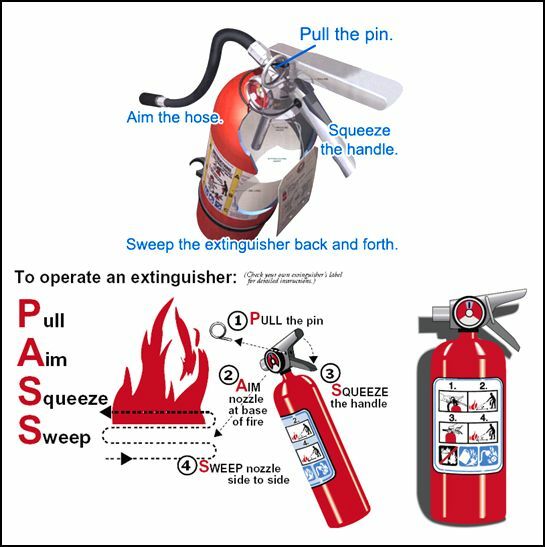 With a firm grasp of the fire extinguisher, squeeze the lever to begin spraying and release to stop. Instead of concentrating the extinguishing agent in one spot, sweep from side to side to cover the base of the flame equally. This will help keep the fire from spreading and will allow you to move closer to get better aim as you advance. Okay, so now that you know how to effectively use a fire extinguisher, here are some rules for when to instead back down and leave it to the professionals. If you don’t know what’s burning, then it’s best to to leave it to the pros. As stated earlier, not knowing what is burning and using the wrong kind of fire extinguisher can make matters worse. Chances are you’ll have a pretty good idea what caused the fire, but only attempt to fight it if you are absolutely sure what you’re dealing with. Also, take note of the nature of the fire. If it is spreading rapidly and is much larger than when it first started and there are no lives in immediate danger, it is probably too late to try and curtail the flames. In addition to the necessity of having the right type or size of fire extinguisher, don’t attempt to fight the fire if you do not have the right protective equipment. In addition to the fire producing large amounts of toxic smoke, combustions may produce harmful levels carbon monoxide. Other chemicals found in burning car seats and interiors may also produce highly toxic gases that are harmful if breathed in. If you don’t have a good feeling or are uncomfortable with the situation at any point, it’s probably best to let the fire department do its job. Don’t put yourself in danger only to get trapped with no way out. Always have a way to flee from the fire. In case the fire gets worse quickly or your fire extinguisher runs empty or malfunctions, you need a way to escape danger immediately. Never let yourself get surrounded by flames. 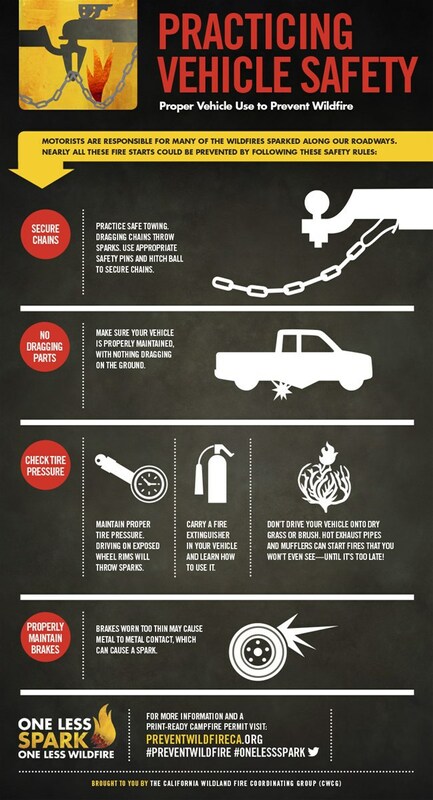 Now that we’ve covered some of the basics of how you can fight a vehicle fire and how to know when not to, here are a few preemptive ways you can help prevent wildfires caused by vehicles. According to the California Department of Forestry & Fire Protection (ReadyforWildfire.org), there are several things we can do to ensure we are a part of the solution and not a part of the problem. Here’s an informative graphic they did to illustrate several practical ways we can help prevent fires from starting in the first place. The same goes for car parts dragging. Make sure your vehicle is properly maintained to prevent needless sparks from sagging bumpers, mufflers and other parts of the vehicle’s undercarriage. This one seems easy but is often forgotten. Before hitting the road, be sure to check your tire pressure regularly. Under-inflated tires can lead to wheel rims throwing sparks. Plus, it’s a good practice to make a part of your regular routine if you don’t do so already. Replace worn brake pads. Metal to metal contact from brakes worn too thin has also been known to throw sparks. I would also add this to the list: if you enjoy a smoke, that’s your choice. However, don’t throw your cigarette butts out the car window, especially in dry, windy weather. The benefit and convenience to you is not worth the potential harm and repercussions that may be attributed to your actions. Well there you have it. I hope this was helpful to you and gave you some food for thought. If you liked this article please let me know and leave a note in the comments below. If you think there’s helpful information that others need to know, please feel free to share it with your social networks as well using the share buttons provided. 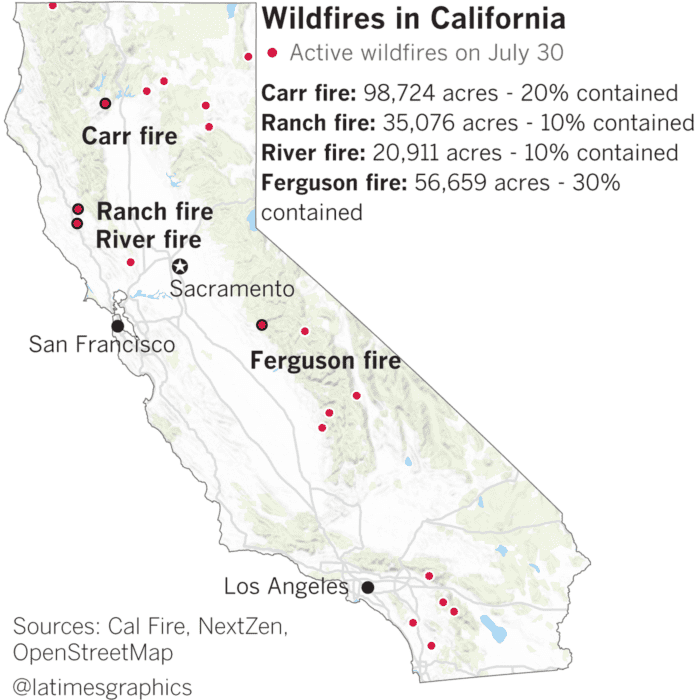 https://www.cnn.com/2018/07/30/us/carr-fire-california/index.html - "Carr Fire in California"
Thanks for putting this out there. Great Advice! Having experienced a car fire myself a number of years ago and being the daughter of a fireman I know this to be super important! Fantastic info. Fire extinguishers all around the house, but never gave the car a thought! Thanks, Kim! It is a very easily overlooked accessory! Couple of real life scenarios. A tow truck pulled a “brown delivery truck” thru an area. Something was dragging and made several wild fires. My inlaws had a car fire. A few people stopped and emptied their fire extinguishers. A review of the situation showed the fire was caused by an electrical situation and as long as the positive wire stayed connected to the terminal, the fire kept reigniting. If you live long enuff, you learn it all. Thanks for the kind words, PF and thanks for sharing your real life scenarios. When it comes to what causes fires, It’s a good reminder that even the littlest concern at the time can mean big trouble.